What do these three lovely ladies have in common? I will be meeting them all this February. 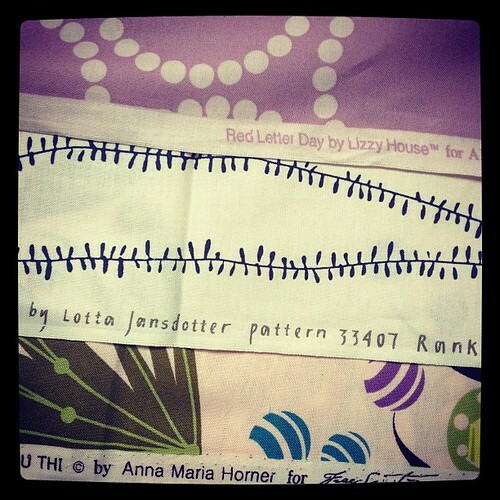 As in I got in to Quiltcon and registered for workshops with Lizzy House, Lotta Jansdotter and Anna Maria Horner. EEEP!!! If you thought I was excited yesterday, you should see me today. I am about to bubble over. I had to come tell you because no one in my real life actually knows who any of these people are! On to the details, in hopes that some of you also lucked out and are going to Quiltcon in Austin this February. Because I just signed up for what I wanted with no thought of knowing a soul in any of them and am now slightly worried about that fact. I was tempted to go back and see if I could add another workshop, but my bill was adding up fast and I think I am bringing my husband along for some of this trip. So I do need some free time to explore Austin. We went about 10 years ago for a UNC football game and have been dying to get back. Oh, and I get the one benefit of a traveling husband - hotel points. Lucky you! It is going to be a blast. Wish I could join you, but we already had plans. Austin is a great city to explore. Courtney, you're in both of my classes! I'm taking AMH's hand quilting class and Lizzy House's mini quilts. I kept myself from registering in everything I would have liked to so that I'll have time to go to lectures and to see the quilt show and to socialize. I can't wait to meet you! Hi Courtney:) We had fun tonight. I would have loved to see your spot, sorry I had to leave. At my age, I have really decided on priorities...So, I do not clean the house, very slack on my paperwork, very little measuring with my blocks which are always off. I take the work I want and say no to the rest and my children are grown and on their own. And, I love to sew and be around quilters. You do not do so bad yourself!! Diane ps..your email refused mine..said I had sent you too many and had reached my limit??? Yay Courtney! I'm going too, though I'm not in the same classes. Hopefully we'll meet. Are you guys going to the dance party? I'm taking the zippy purse class by Denyse Schmidt!, the Kitchen Sink Patchwork Skirt class by Jay McCarroll (woo-hoo Project Runway! ), and the Signature quilt class by Valori Wells. And I understand what you're saying about your friends not getting it - These people are our rock stars! Yay!! I am going too and I will be with you in AMH's class! Eeekk! Sorry I had to skip out on your FPP workshop tonight :( Thank you so much for doing that...I heard you did a great job!! Oh that sounds awesome! I wish I was going so I will be living through your posts! Those classes sound great. We're have at least six or seven attending from our tiny Charleston MQG. I'm so excited. I'm number two on AMH's Composing class wait list. You know I'm going and that we will have one clad together. The others that I am taking are FMQ with Hartman and the Walters class on Sunday.... Can't wait to meet you! oh, my... SO cool :) can't wait to hear all about it!